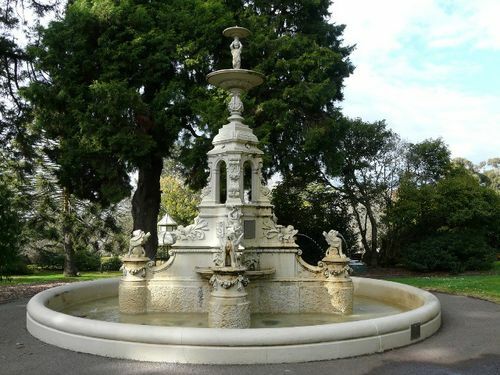 Elaborately sculptured fountain commemorates John Thomson, M.L.A. a leading local citizen who represented Dundas for 22 years. The fountain was restored in 1988. A reinforced concrete and stucco fountain, which has been erected at the entrance to the Hamilton gardens to the memory of the late Hon. John Thomson, was unveiled by the Premier on Friday afternoon. Relatives of the late member were present, and there was a large and representative gathering of Hamilton and district residents. The Mayor (Cr. McLuckie) presided, and called on the Premier to unveil the fountain. Mr. Lawson made touching reference to the unfailing kindness and genial nature of the late Hon. John Thomson, and the Premier's words were endorsed by the mayor (Cr. McLuckie), the Hon. H. J. M. Campbell, M.L.A., the Hon. W. S. Manifold, M.L.C., the Hon. E. J.T. White, M.L.C., Mr. A. S. Rodgers, M.H.R., Mr. W. Slater, M.L.A., the Right Rev. Monsignor Shanahan, and Mr. J. Loughnane. After the ceremony Mr. J. Loughnane thanked the Premier for his kindness in unveiling the fountain, and Mr. Lawson briefly responded. The Premier and other members of Parliament, with local ladies and gentlemen, were hospitably entertained at afternoon tea by Mr. and Mrs. T. H. Laidlaw, at Kilora. Horsham Times (Vic), Tuesday 8 April 1919.